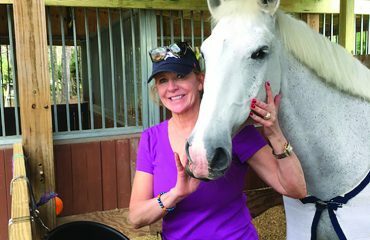 Catching up: Margaret Dinan a long time horsey friend of Cynthia Brewster- Keating has found her way to Aiken thru the website www.aikenhorsesonline.com and is buying a small property in Windsor. Cynthia says it’s been a very nice reunion – they hadn’t seen each other since Cynthia rode at Dana Hall in Wellesley Massachusetts as a kid! Do people have more fun in Aiken? WE THINK SO! …. for instance, there’s Lisa Law, who has a pig in Fox Chase. Lucky for her, all of her neighbors approve of Penelope, no matter what the covenants say. Horses: We were sad to learn that Gretchen and Louis Heffner had to put down their horse Louie (acquired from Aiken Equine Rescue just two years ago) due to an abscess in his abdomen, which was inoperable. 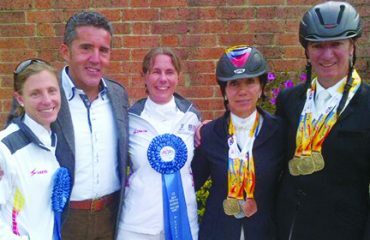 They replaced him with a new paint named Hoax from Heather Carlson who is from New Milford CT.
Start Box: 2012 will bring some big changes to governance of eventing: David O’Conner has just been named Chef of the USEF Eventing Team, and will not run for re-election next year as USEF President. George Morris will finish out his current contract as Jumping Chef, and his replacement is being searched for. 2012 will be very interesting indeed. Talk about bragging rights! Anna Ford, Program Director at New Vocations tells us that former Kentucky Derby contender Z Fortune is officially up for adoption at the New Vocations Racehorse Adoption Program in Lexington, KY. “I believe this is first time a Kentucky Derby contender has been made available for adoption publicly, which could make it a once in a lifetime experience to the lucky chosen adopter,” she says. 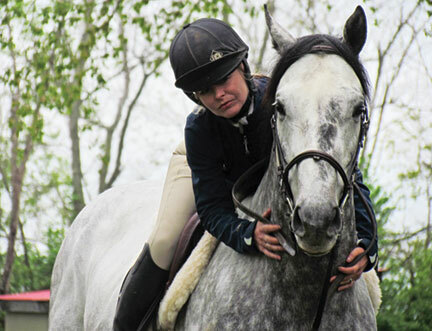 Dressage rider Shannon Dueck spends most of her time in the saddle, but when time permits she can be found diving under the deep blue sea or foxtrotting across the ballroom dance floor. “My husband, Lorne, and I love to dive but we only get to do it rarely. 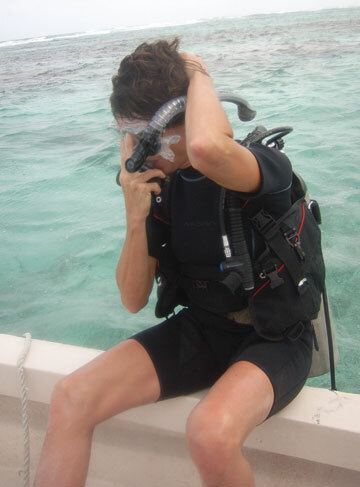 This photo was taken of me in Belize, which has the longest living coral reef in the northern hemisphere. It was wonderful diving and being down there opens up an entirely new world to us! We haven’t been ballroom dancing at all this season, because both Lorne and I are much too busy, but beginning in May we will start lessons again. It’s so fun for us. Ballroom has many similarities to riding dressage -- frame, contact, tempo, etc. -- but it’s with a new twist for me, as I have to be the follower instead of the leader!” Photo courtesy of Shannon Dueck. Z Fortune is currently receiving transitional training for a second career as a riding horse. His information can be seen on the New Vocations website at www.horseadoption.com . Interested individuals are required to fill out an application online. Want to win a pair of DSB Dressage Sport Boots? Love a contest? Check out Custom Saddlery’s website (www.mysaddle.com) and try your hand at the “Find Ravel” contest. Photos of Steffen Peters and Ravel can be found the site, and each person who correctly emails in the page names where Ravel’s photos can be found will be entered to win a pair of dressage sport boots. 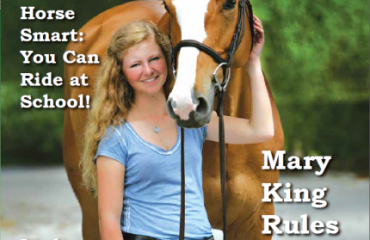 Mark your calendars for Dressage at Devon September 27-October 2, 2011 at the Devon Horse Show Grounds, located on US Route 30, in Devon, PA. Check out the website (www.dressageatdevon.org <http://www.dressageatdevon.org/>), for news regarding new footing, sponsors, ticket information and more.